Hope you all had a nice holiday weekend! 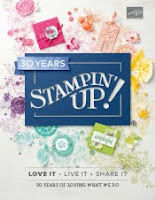 Lots of yard work and planting for me so I'm a happy girl to be back at stamping! I made this quick card for the Clean & Simple Stamping FTL#142 here. 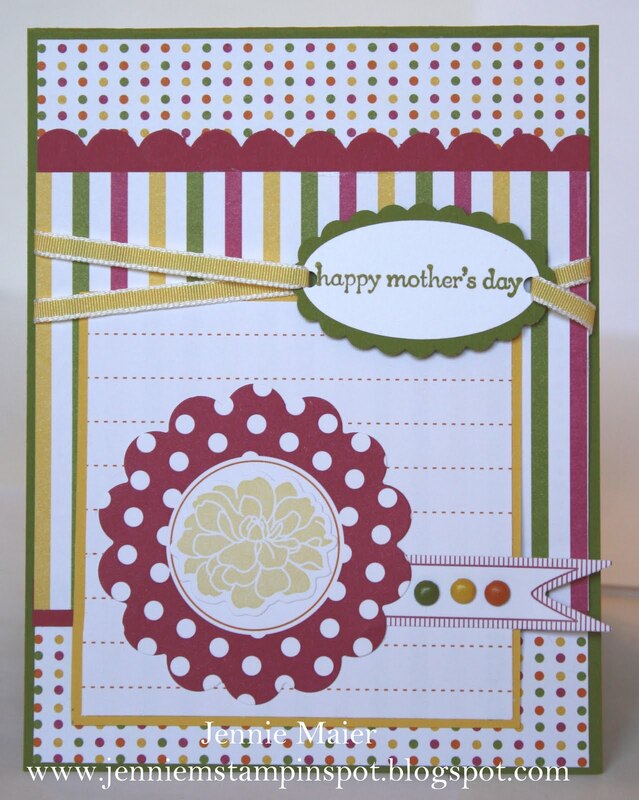 The base is Pacific Point card stock and I added two papers from the Celebrations DSP. 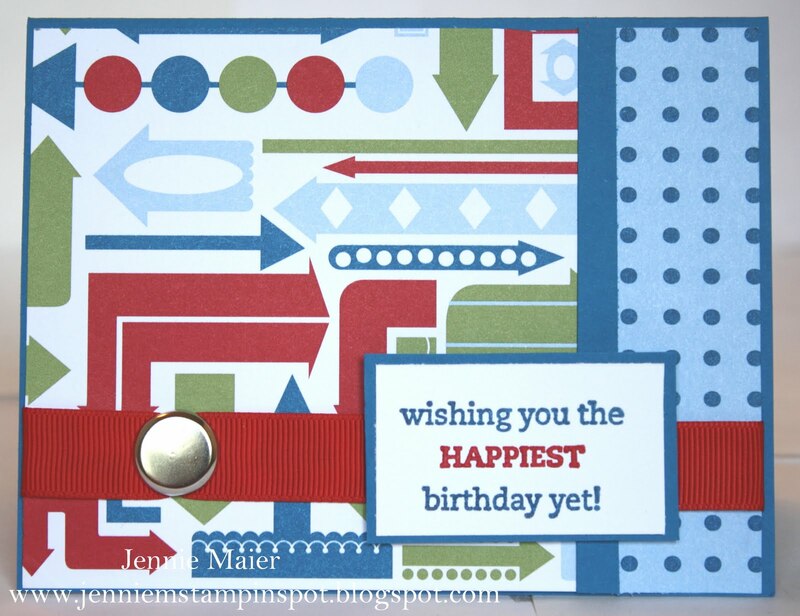 I colored the stamp from On Your Birthday with my Pacific Point and Real Red Stampin' Write Markers and then popped it up with Stampin' dimensionals. I added some 5/8 inch Real Red grosgrain ribbon. Finally, a 5/8 inch Silver Jumbo brad finishes it off. I made this cheerful card without stamping. It was done with the Splitcoast Sketch#334 here. I also used the PPA#95-CAS-Elements of Style-Brads, here. 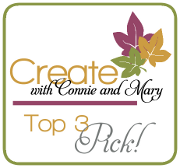 And finally, the Create with Connie and Mary Color Challenge#152 here. The colors to use are Baha Breeze, Peach Parfait and Riding Hood Red. But I just realized I used Poppy Parade instead-oops! 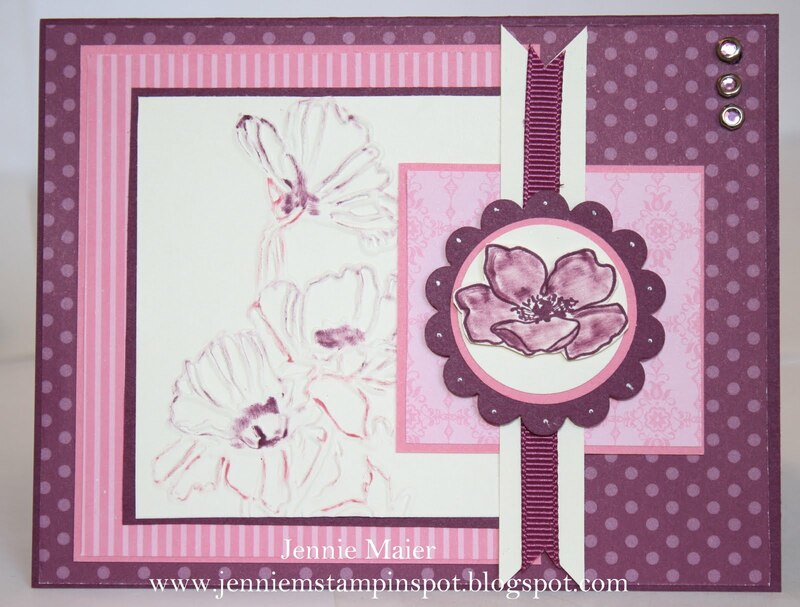 Crumb Cake card stock is the base and then I added some Poppy Parade and DSP from the DSP Pack In-Color. I ran some Crumb Cake thru the Big Shot with the Square Lattice embossing folder and then some Baha Breeze, Peach Parfait and Poppy Parade thru the Big Shot with the Perfect Polka Dots embossing folder. I punched out the Poppy circle with the 1 3/4 inch XL Circle punch and used the 2 1/2 inch XL Circle punch on the other two colors. 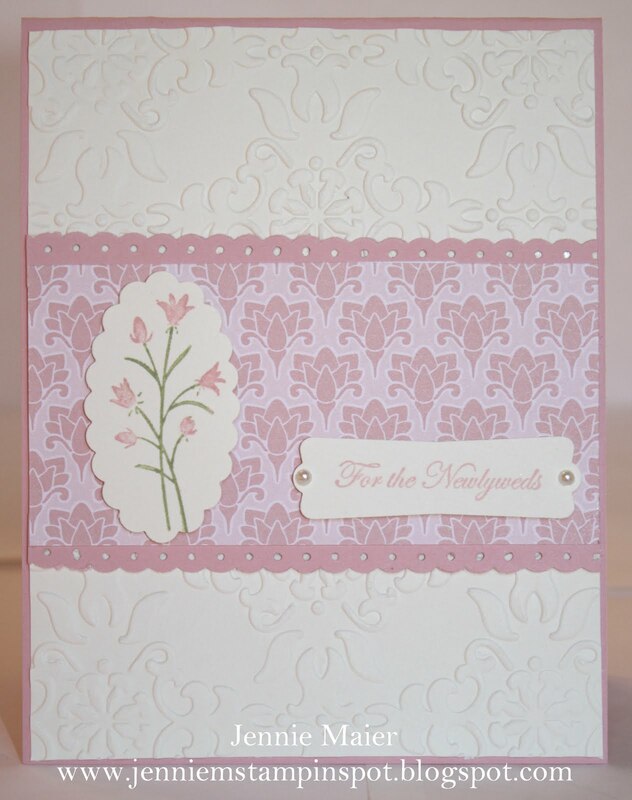 I used the Blossom Bouquet Triple Layer Punch on more In-Color DSP and some Baha Breeze to punch out the flowers. The 1/2 inch Small Circle punch was used on the tree colors too. 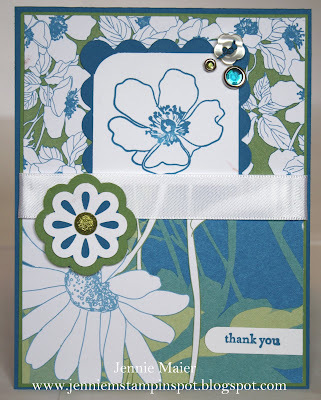 Finally, I added three Glimmer Brads to finish off the flowers and popped up the centers with Stampin' dimensionals. I made this one with the MojoMonday Sketch#192 here. The base is Whisper White card stock and I added some Rose Red card stock then paper and die cuts from the Playful Polka Dots Simply Scrappin' Kit. 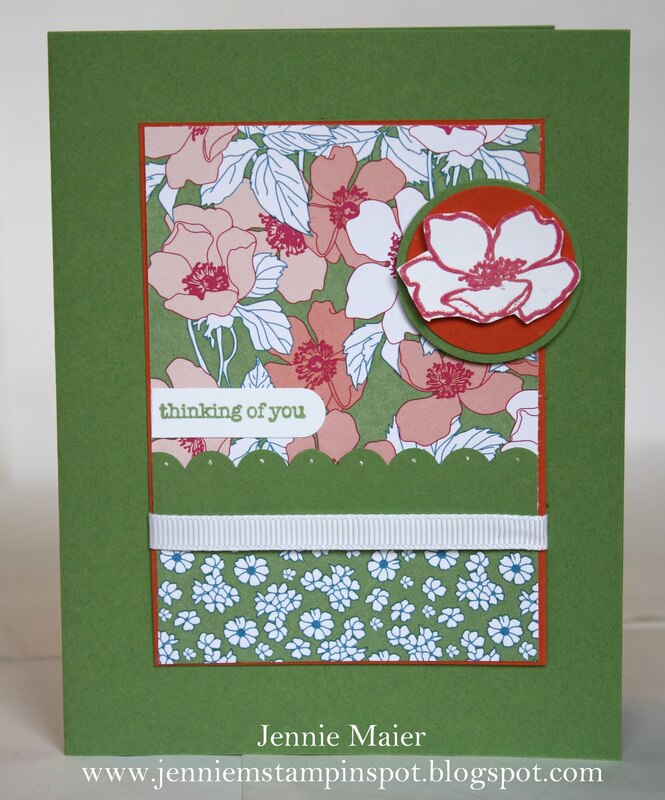 I stamped the stems from Fabulous Florets in Old Olive then added a Rose Red flower die cut from the Scrappin' Kit, popping it up with Stampin' dimensionals. 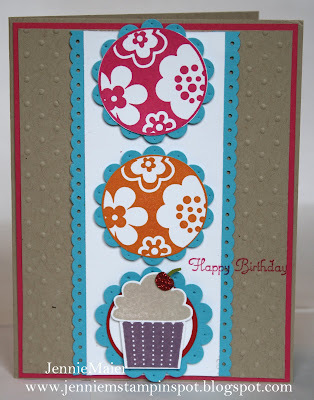 I cut out the scalloped Rose Red piece with the Scallop Circle#2 Big Shot die. I punched an Old Olive circle with the 1 3/8 inch Large Circle punch. The Daffodil Delight flower was punched out with the Blossom Bouquet Triple Layer Punch. I added an Old Olive Brights Brad to the center. Then I popped up the whole piece with Stampin' dimensionals. I stamped the tag and greeting from Tiny Tags in Rose Red, Daffodil Delight and Old Olive and punched it out with the Medium Jewelry Tag punch. Finally, some 3/8 inch Daffodil Delight taffeta ribbon finishes it off. 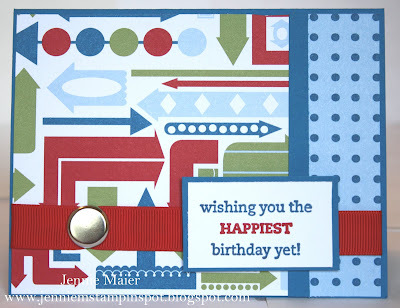 I made this bright birthday card for the Stamping 411 Sketch#204 here. This card came together so fast that I know I'll use this sketch again! My base is Real Red card stock and I added papers from the Celebrations DSP. 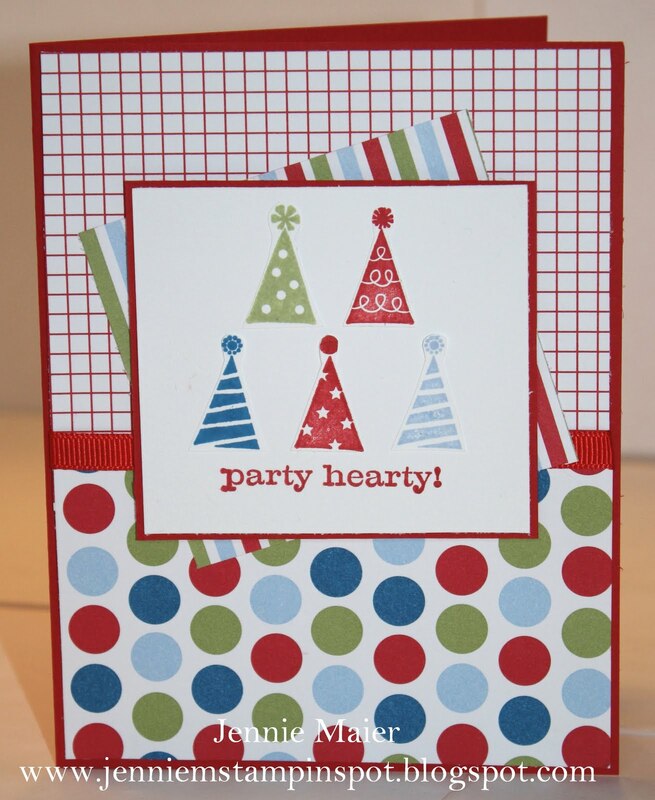 I stamped the party hats from Party Hearty(30% off now thru May 31st) a few times in Bashful Blue, Pacific Point, Pear Pizzazz and Real Red then cut them out. Party Hearty was stamped in Real Red. Finally, some 1/4 inch Real Red grosgrain ribbon finishes it off. I made this one for the Create with Connie and Mary Sketch Challenge151 here, and the Splitcoast Color Combination#324 here. The colors to use are Baha Breeze, Perfect Plum and Soft Suede. My base is Soft Suede card stock then I added some Baha Breeze and DSP from Elegant Soiree. I stamped the sentiment from Occasional Quotes in Soft Suede on Very Vanilla and matted it with some Soft Suede. I stamped the "bee hive" image from Circle Circus in Perfect Plum and trimmed it down, adding a Perfect Plum piece punched with the 1 inch Circle punch. I ran some Baha Breeze thru the Big Shot with the Square Lattice Embossing Folder and punched out two circles with the 1 1/4 inch Circle punch. 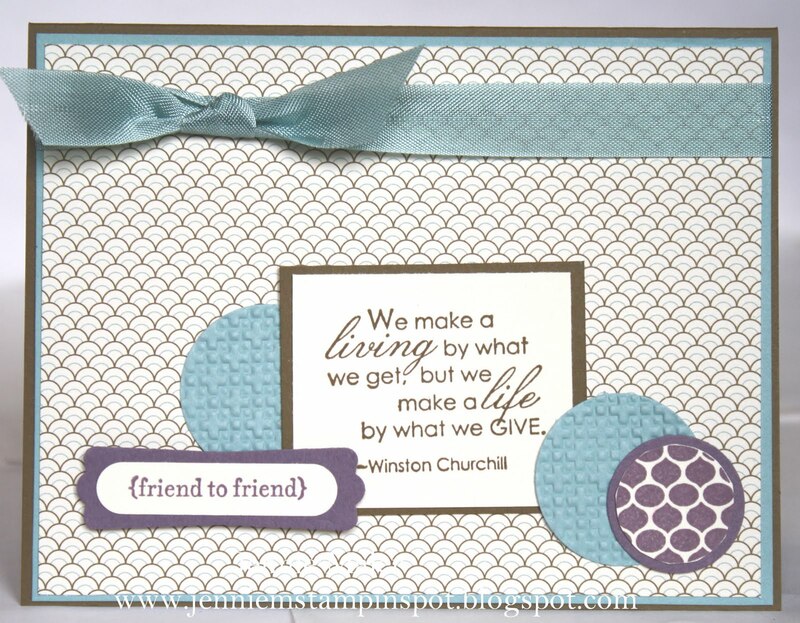 I stamped friend to friend from Teeny Tiny Wishes in Perfect Plum and punched it out with the Word Window punch. 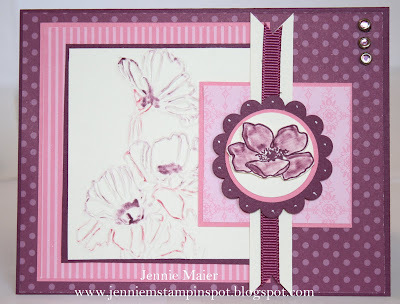 I added a Perfect Plum piece punched with the Modern Label punch and popped it up with Stampin' dimensionals. Finally, some Baha Breeze 1/2 inch seam binding finishes it off. 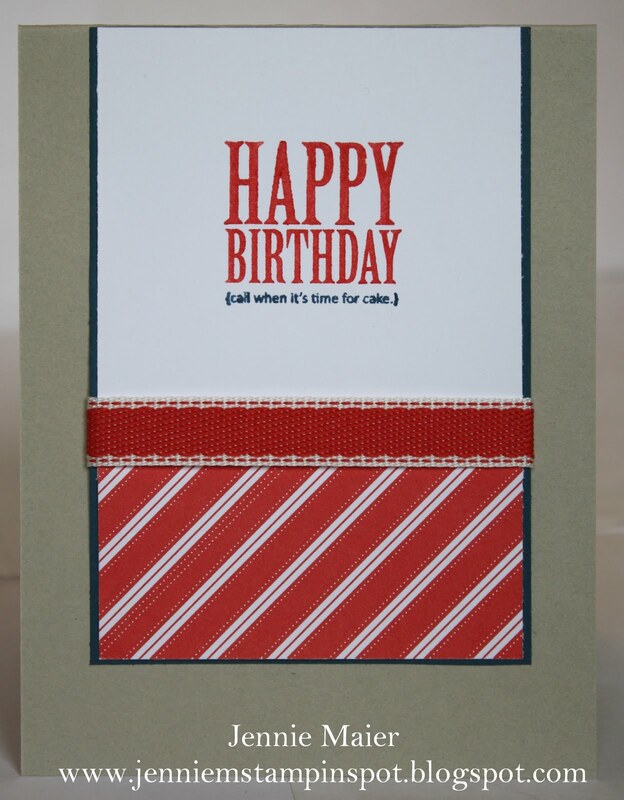 I made this quick card using the Clean and Simple Stamping FTL#141 here. 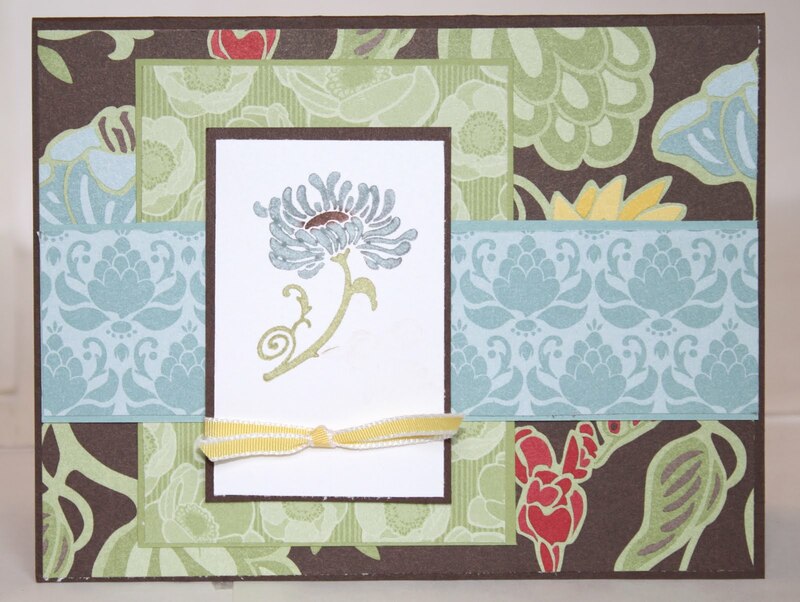 The base is Wild Wasabi card stock and then I added some papers from Beyond the Garden DSP. I ran a strip of Wasabi thru the Scallop Edge Border punch and added dots with the White Gel pen. I inked up the flower from Fabulous Florets in Versamark and added some Melon Mambo Embossing powder then heat set it. 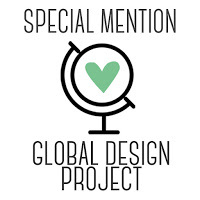 I popped that up with a Stampin' dimensional. I used the 1 1/4 inch and 1 3/8 inch Large Circle punches for the Tangerine Tango and Wild Wasabi pieces. I stamped thinking of you from Teeny Tiny Wishes in Wild Wasabi and punched it out with the Word Window punch. Finally, some 1/4 inch Whisper White grosgrain finishes it off. I made this birthday card for the PPA#94 Sketch Challenge here. The base is Crumb Cake card stock and I added some Melon Mambo. 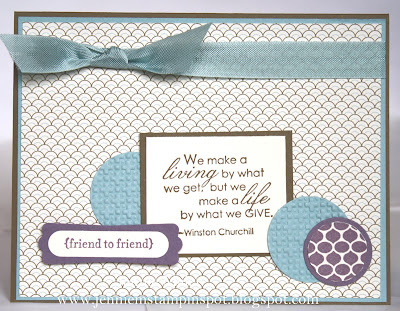 I ran a piece of Crumb Cake thru the Big Shot with the Perfect Polka Dots textured impressions embossing folder. I ran the Tempting Turquoise pieces thru the Dotted Scallop Ribbon Border punch. I punched out three Turquoise pieces with the 1 3/4 inch XL Scallop Circle punch. I stamped the image from Circle Circus twice, once in Melon Mambo and once in Pumpkin Pie, trimming them down. I punched holes in all the scallop circle pieces with the Paper-Piercing Tool. I inked the frosting from Create a Cupcake in Crumb Cake and the bottom in Pale Plum and punched them out with the XL Build a Cupcake Punch. I also used the punch on some Red Glitter paper and Old Olive card stock for the cherry. Behind the cherry I punched a Whisper White piece with the 1 1/4 inch Circle punch and a Real Red piece with the 1 3/8 inch Circle punch. Finally, I stamped Happy Birthday in Melon Mambo. I made this bright thank you for the Splitcoast Sketch Challenge#333 here. 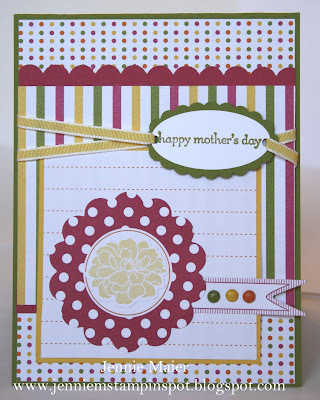 The base is Basic Black and I added two patterned papers from the Patterns DSP Brights Stack. I ran a strip of Basic Black thru the Dotted Scallop Ribbon Border punch. I used the Blossom Bouquet Triple Layers punch for all the flowers. 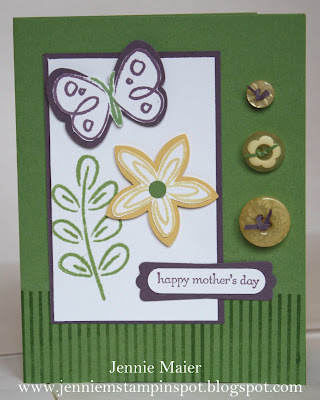 And the Itty Bitty Shapes punches pack circle punch for the center of the flowers. I stamped the stem from Bold Blossom in Old Olive, the sentiment in Real Red and the flower in Daffodil Delight. I added a Real Red brad to the center of the flower and popped it up with Stampin' dimensionals. I punched out the Whisper White piece with the 1 3/4 by 7/8 inch Large Oval punch. Finally, a piece of Basic Black punched with the Scallop Oval punch finishes it off. This is my take on the MojoMonday Sketch#191 here and the Splitcoast Color Challenge#323 here. The colors to use are Regal Rose, Rich Razzleberry and Very Vanilla. The base is Rich Razzleberry card stock and I added some Razzleberry and Regal Rose DSP from the Patterns DSP Brights Stack. I ran a piece of Very Vanilla thru the Big Shot with the Flower Garden textured impressions embossing folder. Then I colored a bit of that with Regal Rose and Rich Razzleberry inks and Blender pens. I stamped the flower from Fabulous Florets in Rich Razzleberry, colored that in with ink and Blender pens, cut it out and popped it up with Stampin' dimensionals. I used the 1 3/4 inch XL Scallop Circle punch on some Razzleberry paper, the 1 1/4 inch Circle punch on Vanilla paper and the 1 3/8 inch Circle punch on Regal Rose paper. I added a piece of 1/4 inch Rich Razzleberry grosgrain to a piece of Very Vanilla and notched out the center for the "banner-like" effect. Finally, three Circle Fire Rhinestone brads finish it off. This is my take on the Stamping 411 Sketch#203 here. I started with Daffodil Delight card stock and added some Sunny Garden DSP. I used the Scallop Square Bigz die on the Peach Parfait piece, just cutting it down a bit for my needs. I added some Pear Pizzazz card stock behind the Whisper White. 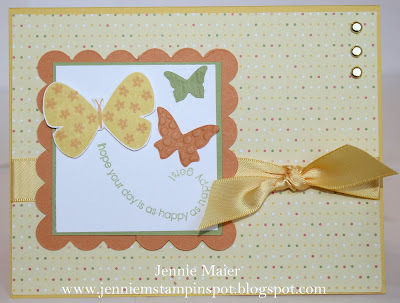 I stamped the sentiment from Flight of the Butterfly in Pear Pizzazz. 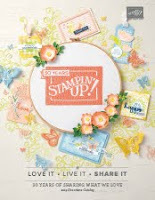 I used the Stamp-a-ma-jig for the Daffodil Delight and Peach Parfait butterflies and popped it up with Stampin' dimensionals. The smaller, textured butterflies were cut out with the Beautiful Wings embosslits die. I added three Gold brads to the top right hand corner. Finally, some 5/8 inch Daffodil Delight satin ribbon finishes it off. This is a wedding card I made for the PPA#93-Here Comes the Bride, and using the Clean and Simple Stamping FTL#140 here. The base is Blushing Bride card stock. I ran some Very Vanilla card stock thru the Big Shot with the Vintage Wallpaper textured impressions embossing folder. I ran two strips of Blushing Bride thru the Dotted Scallop Ribbon Border punch. I added a piece of Blushing Bride DSP from the DSP Pack In-Color. I colored the stamp from Pocket Silhouettes with my Blushing Bride and Pear Pizzazz Stampin' Write Markers, stamped it on Very Vanilla and punched it out with the XL Scallop Oval punch. I stamped For the Newlyweds from Teeny Tiny Wishes in Blushing Bride on Very Vanilla and punched it out with the Modern Label punch. I added two tiny Basic Pearls Jewels. Finally, I popped up both Very Vanilla pieces with Stampin' dimensionals. I made this one for the Splitcoast Sketch#332 here. The base is Chocolate Chip card stock and I added three papers from the Greenhouse Gala DSP. I colored the stamp from Friends Never Fade with my Baha Breeze, Chocolate Chip and Pear Pizzazz Stampin' Write Markers and stamped it on Whisper White. Finally, some 1/8 inch Daffodil Delight taffeta ribbon finishes it off. This is my take on the MojoMonday sketch#190 here. I started with a base of Pacific Point card stock and added some Wild Wasabi card stock. The papers are from Beyond the Garden DSP. 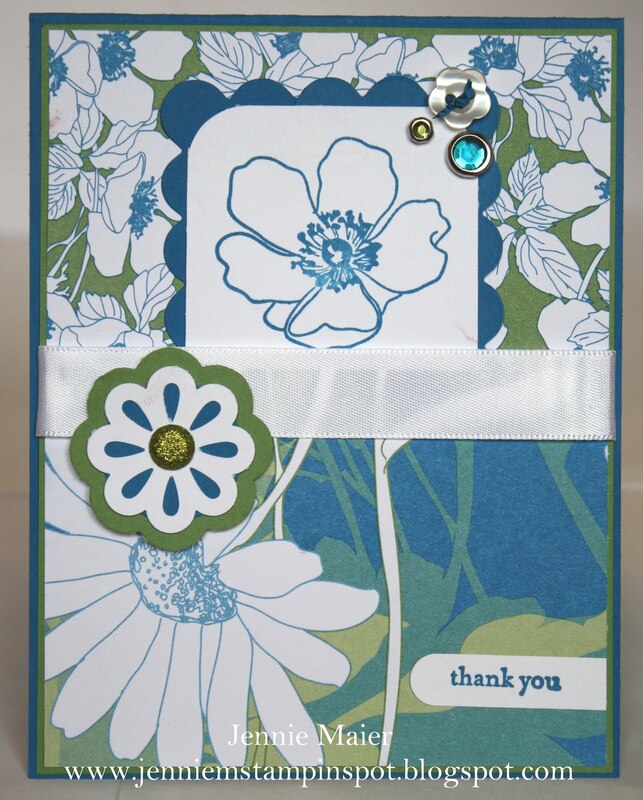 I stamped the flower from Fabulous Florets in Pacific Point. I used the Scallop Square Bigz die on some Pacific Point card stock and then just cut it up and adhered it together for the scallop rectangle border. I punched out the Wasabi, Pacific Point and Whisper White flower with the Blossom Bouquet Triple Layer punch. I added a Glimmer brad to the center and popped it up with Stamin' dimensionals. I stamped thank you from Teeny Tiny Wishes in Pacific Point and punched it out with the Word Window punch. On the top right-hand corner there is a Whisper White button and two Circle Ice Rhinestone brads. Finally, some 5/8 inch Whisper White satin ribbon finishes it off. I made this really quick card for two challenges. First, using the Clean and Simple FTL#139 here, and second, using the Create with Connie and Mary Color Challenge#150 here. The colors to use are Poppy Parade, Sahara Sand and Not Quite Navy. 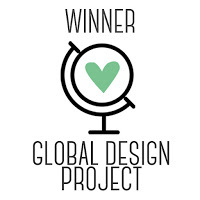 The base is Sahara Sand card stock. I used a bit of Poppy Parade DSP from the DSP Pack-In Color. I matted that and the Whisper White with Not Quite Navy. I colored the stamp from Afterthoughts with my Poppy Parade and Not Quite Navy Stampin' Write Markers. Finally, some 1/2 inch Poppy Parade stitched-poly ribbon finishes it off. 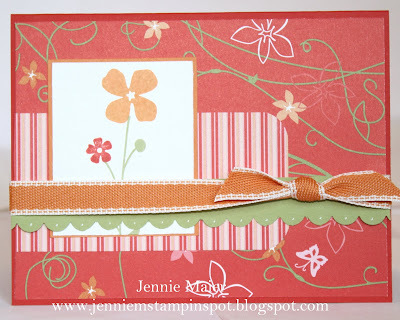 I made this card using the Stamping 411 sketch#202 here and the Splitcoast Color Challenge#322 here, using the colors Blushing Bride, Certainly Celery and So Saffron. My base is Blushing Bride card stock and I added some paper from the DSP Pack In-Color. I ran a strip of Certainly Celery thru the Scallop Edge Border punch and added some dots with my White Gel pen. I stamped the flowers and leaves from Flower Fest in Blushing Bride, Certainly Celery and So Saffron on the same color card stock and cut them out. I punched out the So Saffron one with the 5-Petal XL Flower punch. I added a Certainly Celery brad to the center of the So Saffron flower. I popped up the Blushing Bride one with a Stampin' dimensional. I stamped thinking of you from Teeny Tiny Wishes in Blushing Bride, punched it out with the Word Window punch and added a Blushing Bride piece punched with the Modern Label punch. Finally, some 1/2 inch Blushing Bride stitched-poly ribbon finishes it off. I made this one with the Splitcoast Sketch#331 here. The base is Riding Hood Red and then I added some Basic Black and papers from the Love Letter DSP. 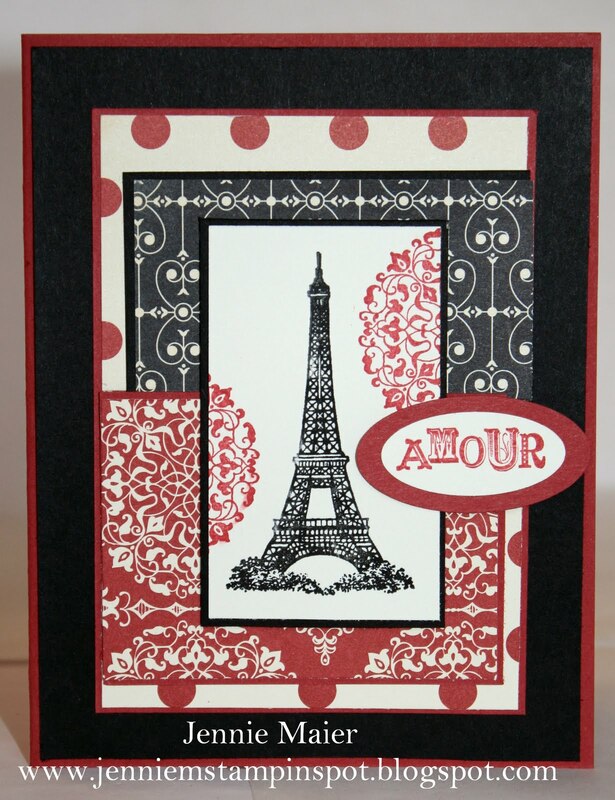 I stamped the Eiffel Tower from Artistic Etchings in Basic Black and the circles and Amour in Riding Hood Red. I punched out Amour with the 1 3/8 by 5/8 inch Large Oval punch and added a Riding Hood Red piece punched with the 1 3/4 by 7/8 inch Large Oval punch. 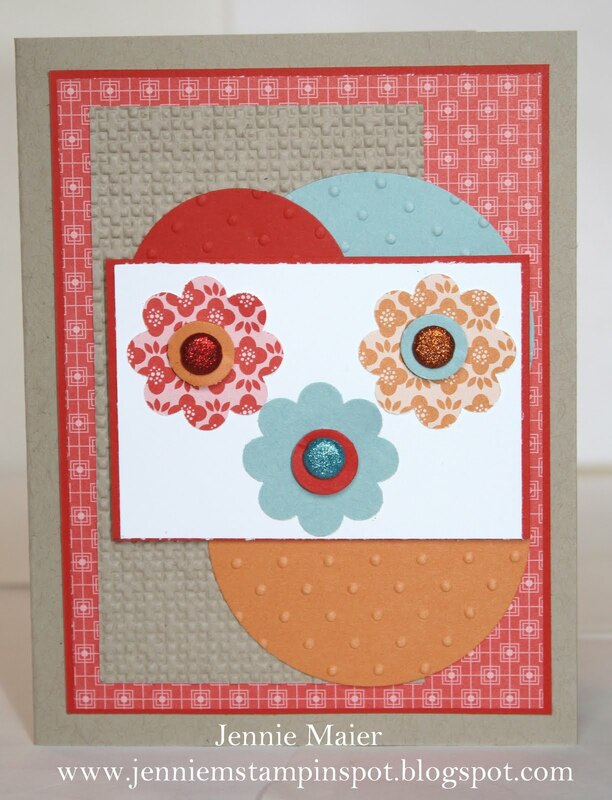 Finally, I popped up the ovals with Stampin' dimensionals. This is my take on the Clean and Simple FTL#138 here. 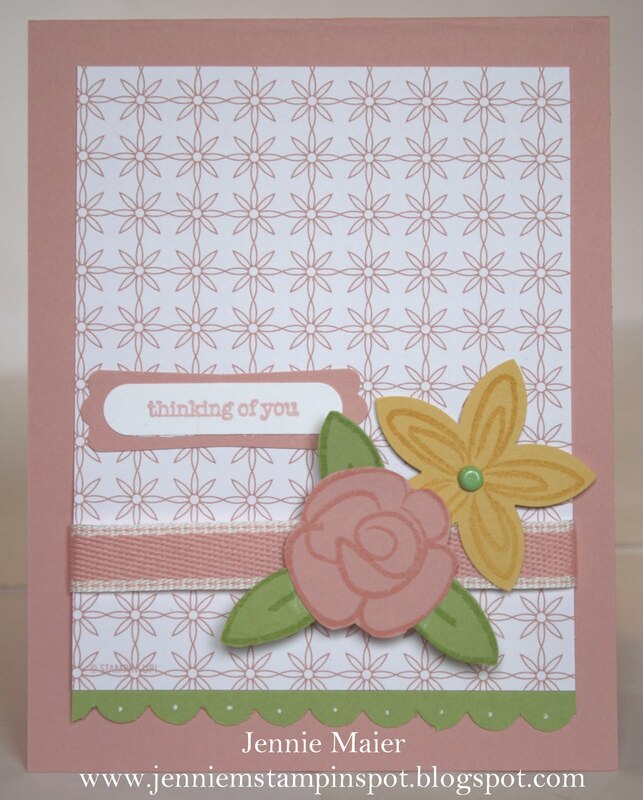 The base is Pumpkin Pie card stock, then I added Whisper White, Daffodil Delight and more Whisper White. I used the flower and circle die cuts from the Playful Polka Dot Simply Scrappin Kit. I did stamp the Daffodil Delight flower from Fabulous Florets and cut it out. The greeting from Teeny Tiny Wishes was stamped in Daffodil Delight, punched out with the Word Window Punch and adhered to a Daffodil Delight piece punched with the Modern Label punch. I made this quick one using the Create with Connie and Mary Sketch Challenge#149 here, and the PPA92 Challenge here. 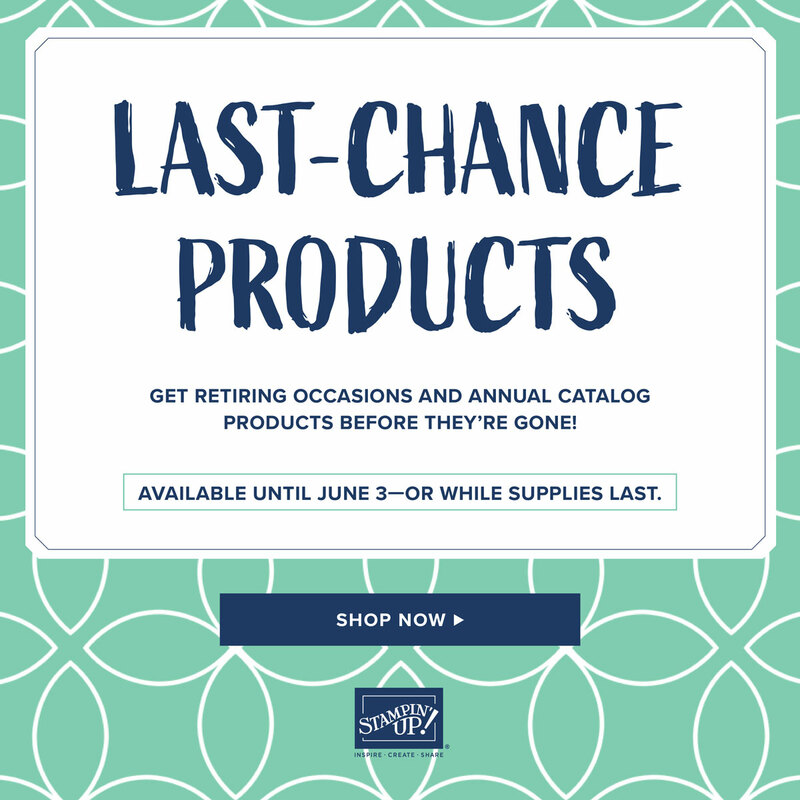 The colors to use were Pear Pizzazz, Peach Parfait and Poppy Parade. 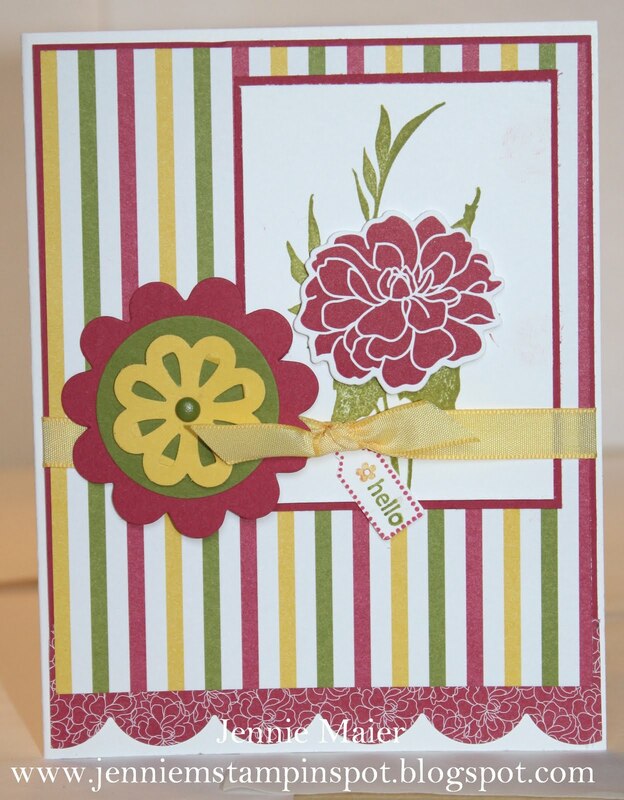 The base is Poppy Parade card stock and I added papers from the Sunny Garden DSP. 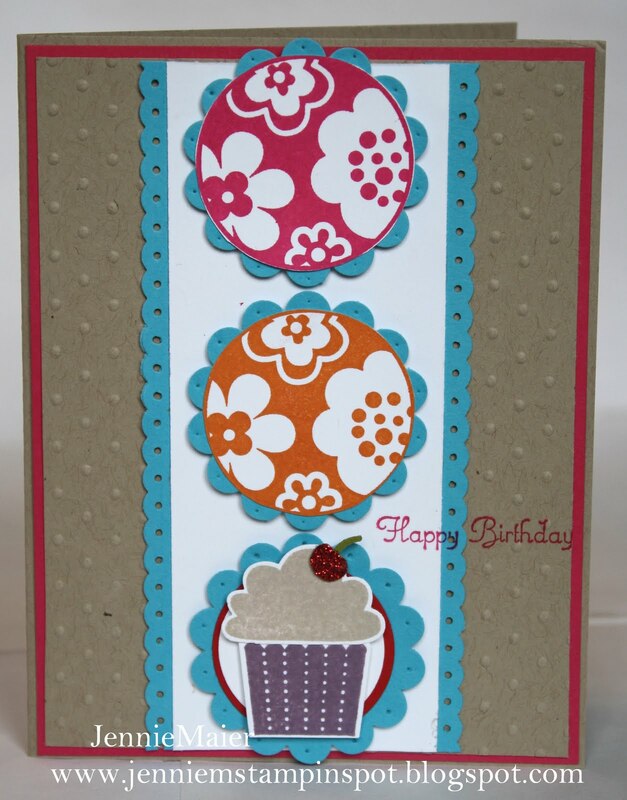 I stamped the stem and flowers from For All You Do in Pear Pizzazz, Peach Parfait and Poppy Parade. 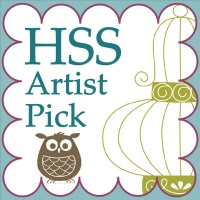 I ran a strip of Pear Pizzazz thru the Scallop Edge Border punch and added some white dots with the White Gel pen. Finally, some 1/2 inch Peach Parfait stitched-poly ribbon finishes it off. I need more Mother's Day cards so this one uses the MojoMonday Sketch#189 here. 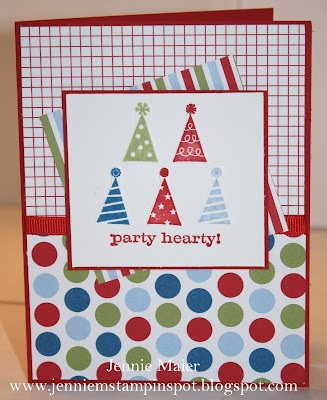 The base is Old Olive card stock and I used papers from the Playful Polka Dots Simply Scrappin' Kit. I used Daffodil Delight and Rose Red card stock too. I ran the Rose Red piece thru the Scallop Edge Border punch. And, I also used the scallop polka-dot circle, Daffodil flower in the center of the circle and the banner from the kit's die cuts. The only stamping was using Teeny Tiny Wishes in Old Olive. I then punched that out with the 1 3/4 by 7/8 inch Large Oval punch and layered it onto an Old Olive piece punched with the XL Scallop Oval punch. I used the 1/16 inch Handheld Circle punch for the holes in the scallop then threaded some 1/8 inch Daffodil Delight taffeta ribbon. 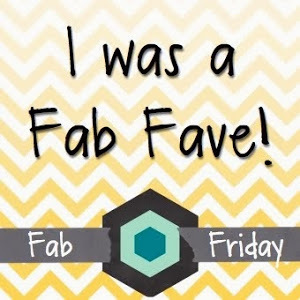 I also popped that up with a Stampin' dimensional. Finally, I added three Brights Brads. 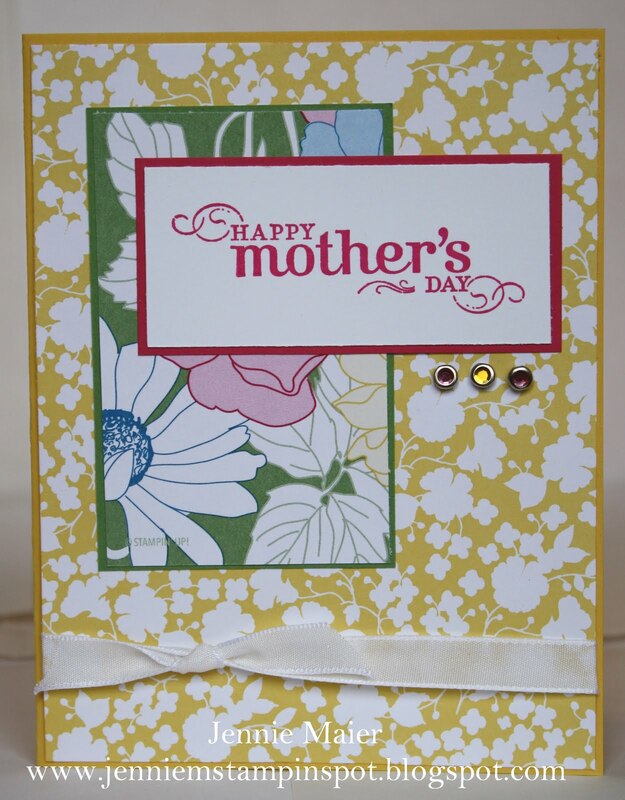 Another Mother's Day card but this one uses the Clean & Simple FTL#137 here. I also used some Beyond the Garden DSP. The base is Tangerine Tango card stock and then I added Beyond the Garden DSP. I stamped the greeting from All Holidays in Tangerine Tango. I stamped the flowers and stems from Fabulous Florets in Daffodil Delight, Tangerine Tango and Wild Wasabi. Finally, some 5/8 inch Daffodil Delight satin ribbon finishes it off. I need a bunch of Mother's Day cards so I made this quick one with the Stamping 411 Sketch#201 here. The base is Daffodil Delight and I added two patterns from Beyond the Garden DSP. 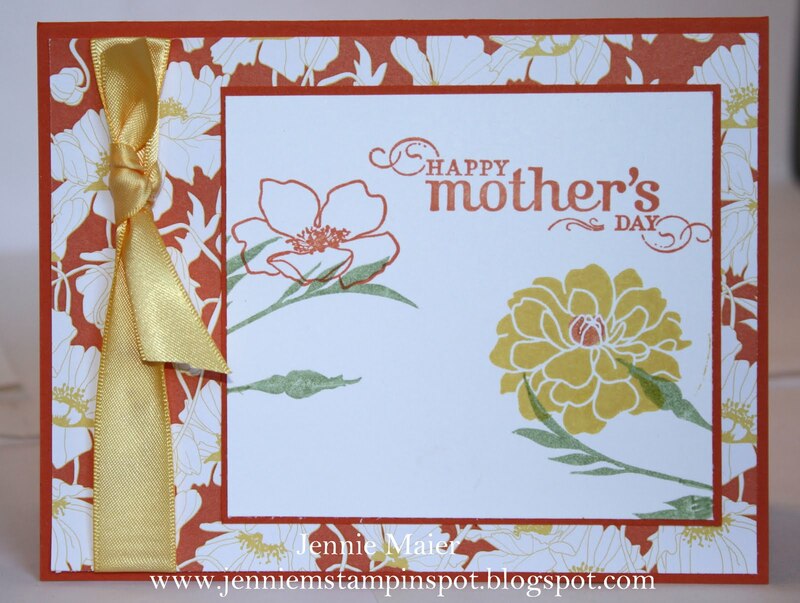 I stamped Happy Mother's Day from All Holidays in Melon Mambo. I added three Circle Fire Rhinestone brads. Finally, some 3/8 inch Whisper White taffeta ribbon finishes it off. Cute and quick! I made this card using the new set, Flower Fest for three challenges. First, the Splitcoast Sketch Challenge#330 here. Second, the Create with Connie and Mary Color Challenge#148 here. This was to use the colors Perfect Plum, So Saffron and Wild Wasabi. And finally, the PPA#91 here, CAS-Buttons. 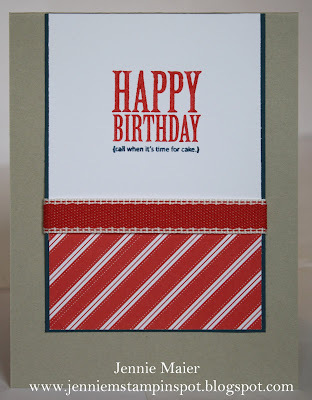 I started with Wild Wasabi card stock and stamped the Solid Stripes background stamp in Wild Wasabi, using my Stamp-a-ma-jig to line up the stripes. 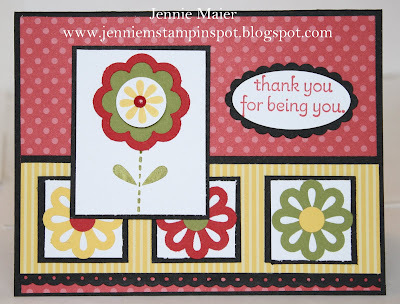 I used Versamark and the Wild Wasabi Stampin' Emboss powder on the Wasabi flower stamp from Flower Fest. I stamped the butterfly in Perfect Plum and Wild Wasabi and trimmed it down then punched a Perfect Plum piece with the XL Butterfly punch. I stamped the flower in So Saffron, again trimming it down and then punched a So Saffron piece with the XL 5-Petal Flower punch. I used the 1/16 inch Handheld circle punch for the Wasabi center. I popped up the butterfly and flower with Stampin' dimensionals. 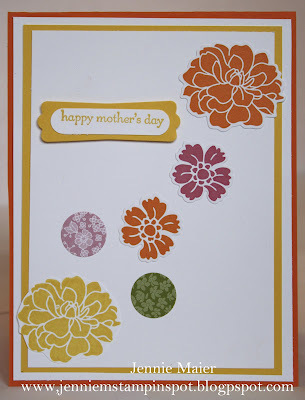 I stamped Happy Mother's Day from Teeny Tiny Wishes in Perfect Plum and punched it out with the Word Window punch. I layered that onto a Perfect Plum piece punched with the Modern Label punch. Finally, some So Saffron buttons were threaded with slivers of Wasabi and Plum and adhered with Glue dots.